Usually for pasta, I only do the simple cooking one, and I’ve never made the baked pasta before. Tonight I want to try it out, as saw this recipe the other day on the TV cooking show, would love to do it. Originally, I was planning to cook Thai food tonight, but I just find out my husband has to work and will be back a little late. Just think maybe to cook something else that he can eat later but still good, I guess baked pasta is a good option. 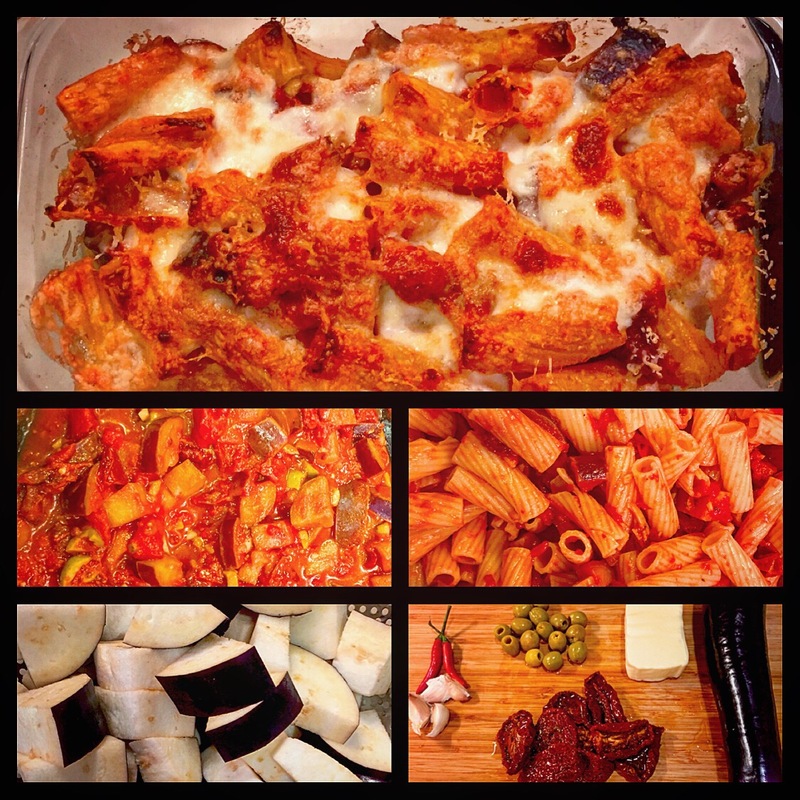 The ingredients of this pasta is pretty simple, rigatoni pasta, aubergine / eggplant, olives, sun-dried tomatoes; cheese is important for baked pasta, I used mozzarella, the fresh one and dry one, and parmesan cheese. You can choose the kind of cheese that you like, but for the top layer, better use parmesan cheese. Use a big pot to boil the water, preparing to cook the rigatoni. On the other side, working on the sauce. Heat up the pan with some olive oil, put the chopped aubergine / eggplant into it and stir fry them. After 2 to 3 minutes, add the chopped olives and sun-dried tomatoes and stir fry them all together. Then add the chopped garlic and red chili, and the tomato puree into the pan, add a bit of salt and cook the sauce for about 10 minutes. When the rigatoni is done cooking in the hot water, add them in the sauce with some parmesan cheese. Basically, you can eat the pasta just like that. Pre-heat the oven with 200C. Put the pasta into a bake tray with one layer, then add the dry and fresh mozzarella, and parmesan cheese. Then, repeat the same with another layer, make sure you cover the entire surface with cheese. Place the tray in the oven and bake for 15 minutes or until the pasta turn golden brown. Watch out that you don’t burn the pasta, otherwise it will become hard instead of crispy. One suggestion is, no need to bake all the pasta in one go, you can just bake the portion that you are going to eat, and leave the rest of the pasta there. You just do the baking part when you want to eat the pasta and that will taste the best. So, when my husband came home, I just bake another pasta for him which takes only 10-15 minutes. And it tastes warm and freshly made.